Privilege, wealth, education, the tensions of haves and have-nots, all provide rich fodder for dramatic theater. Dan Cody's Yacht, Anthony Giardina's latest Manhattan Theatre Club production at City Center Stage 1, is set in two towns just outside Boston, working-class Patchett and upscale Stillwell. Giardina's inspiration came from The Great Gatsby where F. Scott Fitzgerald's wealthy image of Dan Cody's yacht motivated the social climb of wannabe millionaire, Jay Gatz. For Giardina, however, the lure is not a yacht but top-level and costly education. Unfortunately, while Giardina's Dan Cody's Yacht is slickly directed by Doug Hughes and acted by a worthy cast, the plot runs into questionable motives and fades with overblown moments. Cara Russo (Kristen Bush), a struggling single mother living in Patchett with a teenage daughter, teaches English at the well-financed Stillwell High School. At the top of the play, she is having a parent meeting with wealthy financial manager, Kevin O'Neill (Rick Holmes), about his goof-off son, Conor (John Kroft). Cara had given Conor an F for his English paper about the assigned book, The Great Gatsby, which Conor obviously never read. Conor's father, Kevin, rich, gay and obnoxiously self-assured, offers Cara a bribe in exchange for a D grade on Conor's paper and a No vote for a current proposition. The proposition aims to join the two school districts, thus upgrading the Patchett schools. Kevin and Cara are both on the voting committee and Kevin wants Cara to vote No, against the proposition. The reason, of course, is all about money. The method is familiar, guilting the mother. Cara, however, plans to vote Yes. She is well aware that Patchett school that her daughter, Angela (Casey Whyland), attends is far inferior to the school in Stillwell where Cara teaches . Angela, an "A" student with a talent for poetry, reads well-worn, passed-down paperbacks like Exodus, while Cara's Stillwell students receive brand new, more challenging novels, like, The Great Gatsby. Cara realizes that Angela's future is limited as long as she stays in Patchett. Kevin urges Cara to visit his financial club and learn about managing money. Sounds sensible, so Cara agrees. When she meets other members of the club, Geoff (Jordan Lage), Pamela (Meredith Forlenza) and Alice (Laura Kai Che), she easily recognizes their savvy and how well they are faring money-wise under Kevin's tutorship. Before the evening is over, it is obvious that she will agree to let Kevin invest her money. A good choice, and gradually over the weeks, her balance sheet shifts in her favor. We can sense, of course, that the bottom will eventually fall. Cara also sees her life style and confidence change, affecting her relationship with best friend Cathy (Roxanna Hope Radja) in Patchett, during a lunch date . Cara's relationship with her daughter also weakens. Angela, overweight but grounded with a backbone of principles, is astutely played by Whyland. This is evident when Kevin, visits Angela at her after-school job and urges her to show more ambition and demand to go to Vassar, her dream school. Whyland wants none of his phoniness and later shows her grit again in a fierce showdown with her mother. Whyland's strong understanding of her character makes the show but John Kroft also draws a definitive picture of Conor. The boy is stubbornly lazy. His father cannot budge him from his student apathy but Conor is not stupid and, revealed in his conversation with Angela, he shows an astute inkling of his father's manipulative nature. 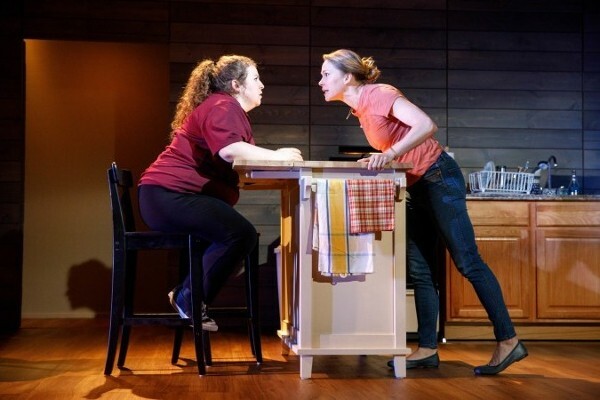 As in Giardino's previous play, The City of Conversation, the dialogue is sharp, but here the plot has sagging moments and questions about motivations. While there are cozy hints of intimacy between Kevin and Cara, Kevin makes it clear from the start that he is gay so it is not romance that reels Cara into his financial plans. With her stated ethical grounding, Cara's folding into Kevin's plans seems unusually easy, especially since he is not really charming and far from likeable. He admits people often call him obnoxious. In short, the motivations of both Kevin and Cara are fuzzy. A roundtable set by John Lee Beatty effortlessly circles to display Cara's simple home and Kevin's obviously upscale house. Catherine Zuber dresses the wealthier women with subtle touches to define them from Cara's casual mall sales. Getting into the right schools is currently a hot theater topic, witness last season's Pipeline by Dominique Moriseau and Joshua Harmon's Admissions, both searing productions. Unfortunately, Dan Cody's Yacht barely reaches a simmer. New York City Center – Stage I.